I am here at Google IO, wearing Google Glass. So, how is it? Overall, I am happy with the device, even though I am only able to use a limited set of functionality at this time. Style and comfort — Since I don’t wear eyeglasses, I was wondering whether it would be comfortable to actually wear Glass all day. There are three options – no lenses, clear lenses or sunglass lenses. Interestingly if I wear any type of lenses, then I get very little notice from other people that I am wearing something unusual. However, for pure comfort, I actually prefer no lenses. The design is lovely, I particularly like the choice of titanium for the frame. Battery — Another pleasant surprise has been battery life. Now, realistically I am not using all of the features, so this might change when I do, however, given the the dismal battery life of other Android devices (i.e. phones), I had low expectations. Glass lasts more than a day with a single charge and re-charges quickly (in an hour or so). Basic OS — the touch and voice navigation work surprisingly well. During the week or so I’ve had Glass, I’ve invited many other people to try it on and the majority can also use touch and voice on the first try. A very big plus has been that the voice commands work surprisingly well even in very noisy environments (parties, train station, etc…) — impressive. Also the device turns on and turns itself off when I expect it to. The Glass team’s goal of ‘it’s there when you want it, and out of the way when you don’t’ works for me. Screen quality — in everything but the brightest sunlight, I can read the text messages on the screen. The quality of the photos and videos is also very good. Phone functions — bluetooth to an iPhone worked just fine. I was able to make and to receive phone calls via Glass without issue. Particular Phone type required — I have an older Android and much of the core functionality works only with newer Android phones. The Glass app won’t install on my phone, so I have to open my laptop if I want to say, connect Glass to wifi (annoying!). I have also tested with iPhone, same problem. While I can take calls via the bluetooth sync (as mentioned above), having the Glass app on my phone would be much more useful. Internet connectivity — this is the real challenge. When it works, which isn’t very often, it takes several tries to read the generated QR code on my computer. The whole process is clunky. It’s been a major disappointment that I have been completely unable to connect while at IO. I really wanted to try out the new Glass apps (Facebook, Twitter, etc…) that were announced here at IO today, but couldn’t due to this issue. I was actually told that I should ‘try the wifi at Starbucks’ by someone at the Glass booth. Also, when connected, I can both see email marked ‘urgent’ on Glass. I can also see my Google Calendar entries. 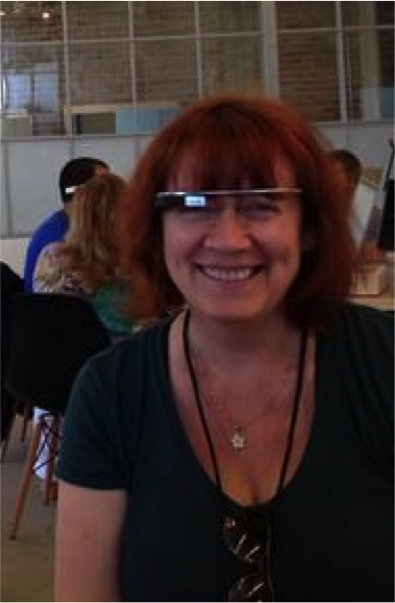 No one at IO has directly asked me to let them try Glass, however when I offered, they were eager (and happy to do so). I find this ‘fake’ blase approach to be notable, I believe it’s an attitude and a limiting one for more technologies than just Glass. The story has been refreshingly different outside of the IO crowd though. Here in San Francisco, everyone seems to know about Glass and really wants it. I’ve let baristas at Starbucks, clerks at Old Navy, cab drivers and waiters try out my Glass. They are all uniformly delighted. In addition to letting non-programmers here in the city try out Glass, last week I let many of the middle and high-school aged kids in Utah (we were on a week-long teaching programming trip there then) try out Glass. They were all enthralled. Also, the kids had zero trouble immediately using Glass. Interestingly, they also asked for MORE features, than what is now available. The most common request was ‘can I watch YouTube on Glass?’ (The answer at this time is ‘no’). To give you a sense of my version of ‘Life Behind Glass’, I’ve compiled (via Camtasia) a short video of my un-edited Glass photos and 10-second Glass videos (which is the default – it can easily be extended by pressing a button on the top right side of the device). All of the images were taken directly from Glass — enjoy! I am part of the initial group of Glass Explorers, we have the devices first so that we can develop applications for Glass. To that end Google has released some information about their REST interface for Glass. Also today, during one of the Glass sessions here at IO, they announced that they are ‘working on a GDK (Glass Developer Kit), which will…give more direct access to the glass hardware, but that the GDK isn’t ready for release yet.’ Among other sessions here today, Google had a session called ‘Voiding Your Warranty, Hacking Glass‘ where they showed how to root the device.